The Leslie Room is on the 3rd floor and has views across the garden to the north and east with Bennachie in the near distance, which is often snow-capped in early spring. It has a turret which is popular with many guests. 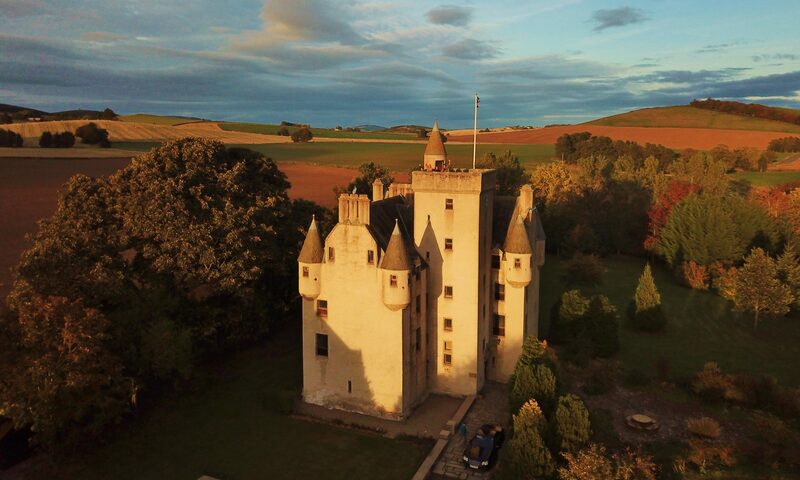 The room has a King size four poster bed and ornate dark oak furniture, custom-made some decades ago in the Jacobite style for the castle, the luxury is low-keyed and unobtrusive. Off of the room is an en-suite toilet and bath with shower. The Rothes Room is on the 2nd floor and has views across the garden to the east over the surrounding countryside and hills. The room has a King size four poster bed and ornate dark oak furniture, custom-made some decades ago in the Jacobite style for the castle, the luxury is low-keyed and unobtrusive. Adjoining the room is an en-suite, toilet and bathroom with a separate shower. Please click on the booking calendar for availability and prices for these rooms, breakfast is included. Dinner served in the Great Hall can be arranged at extra cost please contact us for further information or to make arrangements.